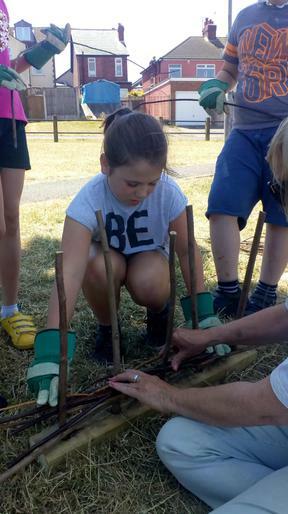 Asquith Primary School has visited Jackson’s Park to work with officers from Greenwood Community Forest Partnership to learn more about the trees they planted earlier this year. 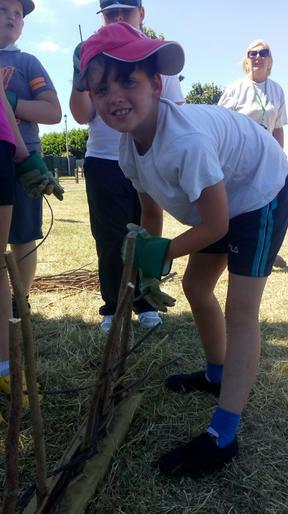 Greenwood Partnership were part of the partnership which planted Jackson’s Fruity Wood in February 2018. Jackson’s Fruity Wood was named by a pupil from Asquith Primary School and the logo was drawn by a second pupil. They were inspired by planting all the trees and hedge plants. 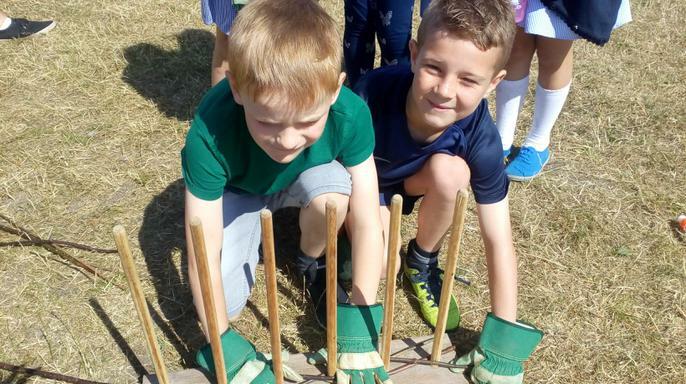 The Greenwood Community Forest, one of 12 Community Forest initiatives in England, helped the school and District Council plan and plant the orchard thanks to Defra funding. This funding also included the delivery of a follow up learning related to the new trees. This learning activity was linked to the School topic week about the Stone Age. 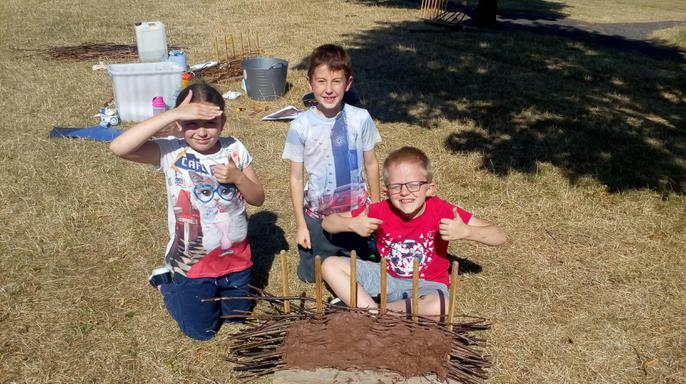 Over eighty children took part in the activity which involved making examples of ‘wattle and daub’ walls to take back to the classroom – very messy! Over the day three classes visited the Park. They took a look at the Orchard to see how it was growing. 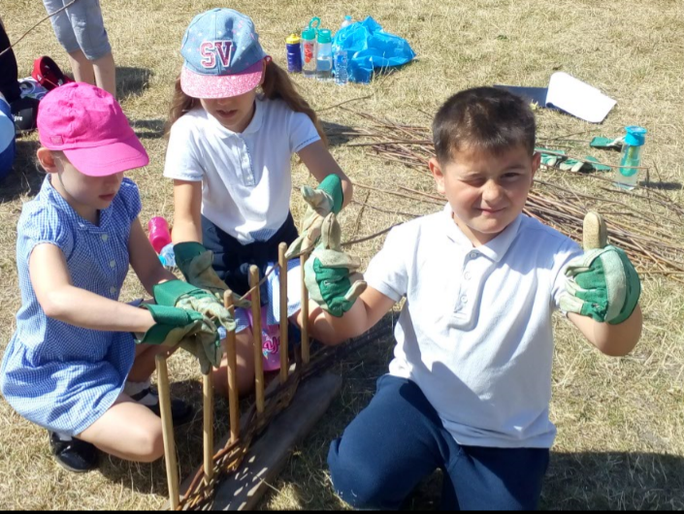 Nic Wort, Project Officer for Greenwood, said: “The Greenwood team is committed to supporting schools to plant trees and working with Defra and England’s Community Forests has helped us to reach even more schools, encouraging them to plant native trees in their school grounds and parks. Hopefully we are creating future green guardians of our parks and green spaces”.